We're now considering taking a trip to Revelstoke, as the snow seems to be lacking here. 6 hours drive, which would mean making it a long weekend to make it worthwhile...it's supposed to have some of the best West coast powder, even if it's mostly a 'skiing' terrain. I buy my skis. I use the formula have a minimum of 10 weeks skiing. 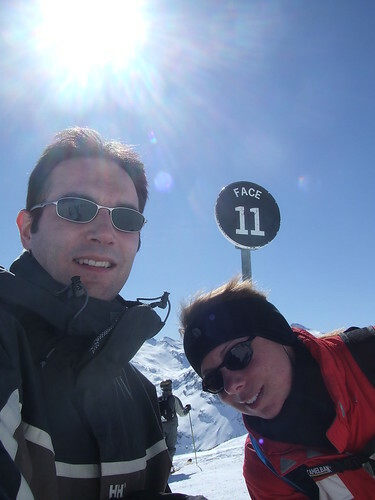 Multiply weeks by cost of 6 day hire, subtract ski service and ski transport costs. This figure is the budget for the next pair of skis. The cost of the skis I use well within budget. Aha, decent sized dump forecast for Saturday! I know where I'm going this Sunday!! It's going be quite chilly, though, so I think I need to buy some mid-weight long johns. I like to be able to take the skis into the shop if the conditions change and get a different type of ski, or swap the whole ski-boots combo for touring kit. My ideal day out is off piste from the top lift, with some skinning and lunch at a refuge on the way down. That's got a bit pricey to do every day with the state of the £, as Heather likes the security of a guide, so it's something we would do on a good day. I've got used to what Jean Sports in Val d'Isere can provide. I've got a set of old touring skis that I use for skiing in England when conditions allow. I bought my skis a couple of years ago based on the fact it would be cheaper to buy a pair of end-of-season skis than it was going to cost me to hire for the 2.5 weeks in Canada that I had planned for that season. Yes I might not get the newest thing going each year, but on the odd occasion I've rented I've been given really awful skis. So I tend to just stick to my own now. Even with the cost of carriage and paying to get them serviced I'm still at a financial advantage. More importantly, you can fit a box of wine, box removed, in the sport tube I transport them around in, just in case there isn't enough in the chalet. Hic. just in case there isn't enough in the chalet. Hic. That situation should never happen. Week in Val d'Isere just booked for 11th March. Yay! I've always found the Epaule de Charvet more demanding. Last year, our apartment was ski-in / ski-out (ish) access from about 200m from the bottom of Face. Tended to be very icy on the lower half ( below where the Bellevarde Express chair reaches ). Epaule is fine, but it does end up in the crowded Santons gulley, and then a bit of a pole out at the bottom. I thought the Epaule was OK but I only skiied it the once as I am quite happy to avoid Santons. Face in the afternoon once it has been chopped up and icy is not very pleasant, but in the morning is ace (but still always scares me for some reason). My least favourite run in Val is Foret under the Fornet lift. It wasn't marked as an ungroomed piste the year I skiied descended it, but it clearly hadn't been groomed once during the season. Narrow, icy and moguls that felt like they were as big as me. No likey one bit. I once was a participant in a race down Face: skiier versus L'Olympique. The skiier won but promptly had to puke at the bottom. It was pretty impressive watching and waving at him from the lift on the way down. The only way to have any fun on Santons is to stay well up on the sides away from the masses in the bottom of the gulley. There will be one stationary person per mogul down there. Keep up on the side walls and blast past them. And once you can see the bottom flat secton, you need to go flat out from as high up as you dare to avoid tedious polling, and hope you don't have to shave off speed to avoid someone. I once was a participant in a race down Face: skiier versus L'Olympique. The skiier won but promptly had to puke at the bottom. Nothing to do with La Folie Douce, that, eh? (My daughter's favourite part of the resort. And I just realised (after checking) - it's a two-faced resort! TBH I wondered what you were talking about, as the Face I went down a few times (Grande Motte) was very nice but not all that remarkable and wasn't black. I missed the real one, it appears. Oh, and Feanor, the alternative Santons approach was to have enough speed to go high enough up the sides to see behind easily on the turn, then decide to either stay up, swing down round a mogul and back up or cross to the other side. As you say, avoiding those trying to ski a flat path in the middle (and often failing). As I think I said upthread, an example of the odd grading in Tignes, maybe if they graded it red it would make it more fun for all ? OK, no way is it difficult, but if you can't ski it properly then it becomes narrow and difficult, so it becomes a victim of its own estimation. I went down it with a mixed group of generally competent but unadventurous skiers and at the end I really didn't understand why just about everyone else was moaning (btw, I wouldn't describe myself as adventurous, just reasonably enthusiastic). I don't think I'll ever understand the slope grading criteria or psychology, though. I'm actually staying in La Daille in March so the Folie Douce will only be a short ski away from my bed. This might be a bad thing. All resorts have their grading 'oddities', often for political ( small p ) reasons. They will want to show a certain 'mix' of grades for the resort stats; they will not want any area to look 'inaccessible', so they may down-grade an access route; they will have targets in relation to what percentage of runs are groomed overnight in each category, and they may want to play with that. Many runs are over-graded (IMHO ) on the basis of one short steepish section. The biggest factor is conditions on-the-day, and gradings don't really help with that. Plenty of blue runs down to various resorts which are a total 'mare late on in the day when the following add up: in shadow, getting a little icy and are heaving with the god awful mix of the timid and the inconsiderate. Nothing wrong with the run itself, just having to pick your way through all the human remains on it. Yes, Happy Valley, I'm looking at you. Plenty of blue runs down to various resorts which are a total 'mare late on in the day when the following add up: in shadow, getting a little icy and are heaving with the god awful mix of the timid and the inconsiderate snowboarders. Nothing wrong with the run itself, just having to pick your way through all the human remains on it. I'm not at all colour prejudiced, I will often choose the empty blue over a crowded red or black (except, slope over path, any day) but the colours do influence people's choices and, as Feanor says, the reason for the grading is not always clear. I used this photo in the Guess the Place thread. It's of Mont Fort in Verbier as seen from the top of Mt Gélé. And here is my post discussing the categorisation of the runs down from the top. The cabin is the top of the cable car. Directly underneath it is the black, and off to the right is the (laughingly categorised) red. At least it was when I was there. I understand now that the red is a black and the black is a 'high mountain tour'. 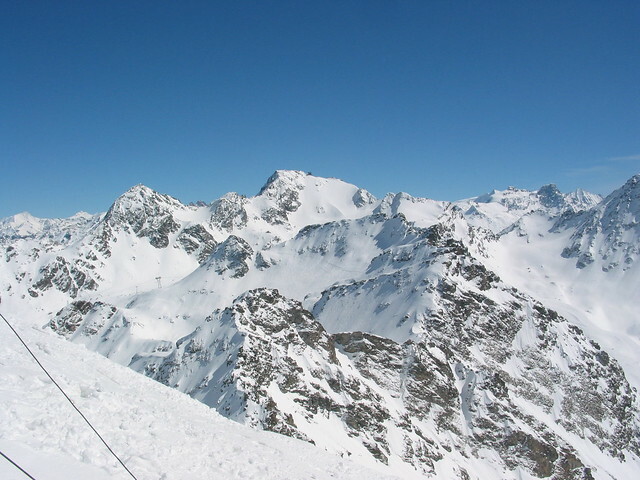 The story was that TéléVerbier categorised the lesser of the two runs as red to encourage people to buy the Mont Fort extension for their lift pass. The problem with the red was that to get to it it was necessary to undertake the walk of death on a severely rutted and icy track, to then be faced with one of the more horrific entries to a marked run in the Alps (and certainly so for a 'red' run). Once there, there really was no turning back. I saw two people fall to their deaths there in the course of two seasons. The black on the other hand had the distinct advantage of not requiring any perilous walk, you simply exited the cable car, turned left instead of right, clicked your skis on and set off. This was always a heart stopping moment. The face is convex at this point, so you couldn't see beyond about four (massive) moguls down. If you didn't make that first turn (and there was only one place to make that turn) it was a very long and very bumpy way down. Never before or since has the word 'commitment' had such relevance to me. Resorts all need to have a range of coloured slopes. If the resort is simply steeper all round then the blues are tougher than in a resort that isn't on average as steep. Difficulty mostly depends on the conditions. I have descended the Sache black in Tignes. Many people have difficulty in the fenced narrow steep section. It is usually heavily mogulled and filled with other timid skiers reducing your turn points and can be very difficult for otherwise competent skiers. I have also done this piste when it was icy flat, that was easy for me but I saw some fallers. I have also done it in flat old cold snow (first opening for the year), my skis cut deeply into the snow exposing blue snow. The turns were hard work but a fascinating descent. Icy can make pistes fun. My favourite illustration of this. I was on a chairlift which used to climb out of Motteret toward Courchevel when twenty or so Courchevel 1850 ESF instructors were coming down from Saulire in a long line about 20 seconds apart. They came to turn in the piste. I reckon about a third of them slipped and fell, very entertaining. The worst conditions is thick fog. I was descending Creux blue in Tignes when poor conditions took a turn for the worse. I could not see my feet. I took a couple of minutes inching from pole to pole feeling very sick from the motion. I returned back up Tommeuse then down Piste H(enri) which was not quite so bad and finished early that afternoon. The other hard snow is avalanche debris. I did not expect to find it on a flat blue run just above Arc1950. I did that to an entire class of kids back in my instructor days. They were more than capable of skiing easy blacks, but the sight of a black diamond on a trail sign scared them. I led them through some trees to avoid the trail sign and they skied the run beautifully but they kept asking why it was so steep. A few other skiers on the run helped me out by joining in with my assurances that "yes, it really is a blue run", until they finally realized that they were skiing quite well and enjoying themselves. After I showed them where they had been on a trail map, they were pretty pleased with themselves. Plenty of blue runs down to various resorts which are a total 'mare late on in the day when the following add up: in shadow, getting a little icy and are heaving with the god awful mix of the timid and the arrogant skiers. Nothing wrong with the run itself, just having to pick your way through all the human remains on it. I see your location is Frisco! Clan Feanor are to be found in Breck every easter,and I know Frisco fairly well. ( We do a week in Breck, and a week in Aspen Snowmass usually ). I've posted these before, but thought I'd re-post for your benefit. This is Junior #1 on the Lake Chutes, an EX Double-black diamond run in Breckenridge, Co. He's 12 at the time I filmed this ( last year ). Normally, when I photo or film ski footage, you don't get any sense of steepness. All the action is in the first 10 seconds or so. You need to look at him as he traverses over and sizes up the first ( committing ) turn. It's worth pausing it and looking at it at this point. He can reach out and touch the wall with his hand. Observe the first turn: look at the rate he drops till he gets his edges set as he completes the turn, and drops out of view. My camera-work is total crap, because I can't see the screen in the bright sun-light, so I'm just pointing it in the general direction. It's not worth viewing beyond when he drops out-of-sight. To those of you who have never tried such stuff, I can tell you this is *very* steep, at 50 degrees, and very committing. Impressive! Before the Imperial chairlift was built I enjoyed hiking from the top of the T-bar to the summit of Peak 8, then either skiing down Imperial Bowl or traversing over to the Lake Chutes. That whole area saw a lot less traffic and was far more satisfying to those who did go there before the Imperial Chair was built.